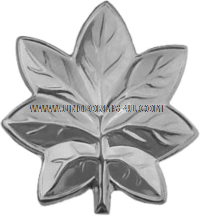 The silver oak leaf that serves as the rank insignia for Commanders in the United States Navy and Coast Guard and for Lieutenant Colonels is actually an insignia of grade, namely O-5, and is also used for Lieutenant Colonels in the Air Force and Army. While the Air Force also requires its Officers to wear rank insignia on its Flight Caps, its equivalent of a Garrison Cap, it uses a different size insignia than the Navy, Marines, and Coast Guard. The Army eliminated its Garrison Cap and instead has Officers wear cap rank on berets. On the Navy’s black or khaki caps and the Coast Guard’s blue caps, the oak leaf is placed vertically, stem down, and the center of the insignia two inches from the front crease and an inch-and-a-half from the bottom of the cap. Marine Corps regulations specify similar vertical orientation on both the male and female Garrison Caps, with the insignia positioned so that the fold of the cap that arcs downward from the front crease bisects the insignia, and the insignia intersects the arc of the fold at approximately its midpoint. 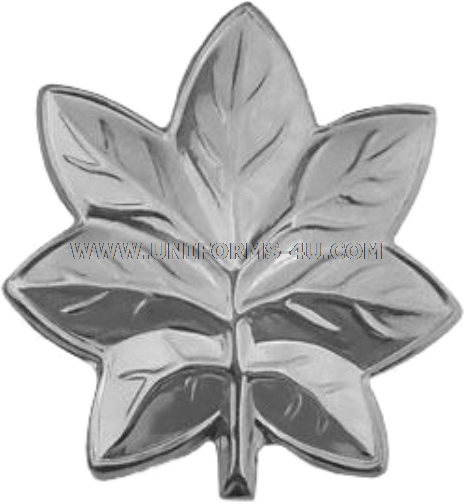 Customers purchasing cap rank insignia for USN/USCG Commanders or USMC Lieutenant Colonels might also wish to pick up a pair of matching collar insignia.